The World on Mercator's Projection Western Part. 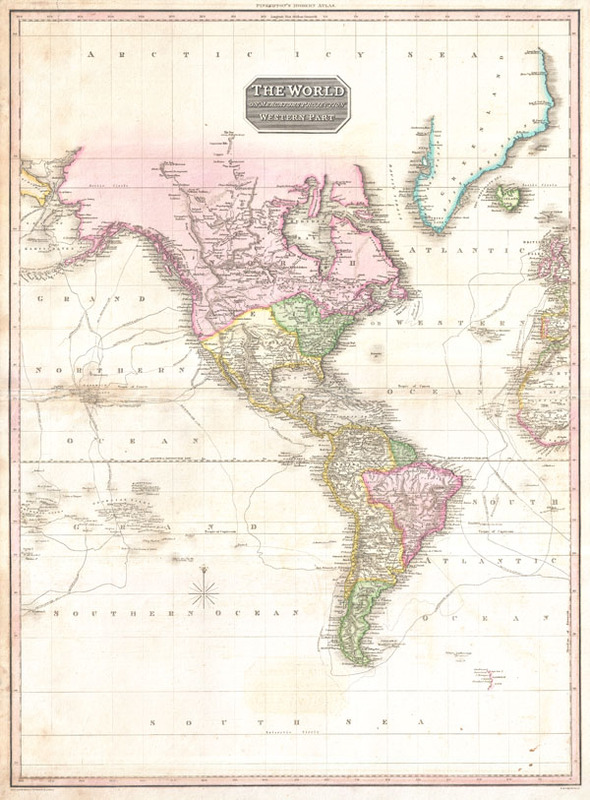 A rare and important 1818 map of the Western Hemisphere by John Pinkerton. Depicts North America, Central America and South America as well as parts of Polynesia, Siberia, Greenland, Iceland, Europe and Africa. The routes of various important explores are noted, including Cook, Vancouver, Perouse, and the return route of the Resolution. In North America, thanks primarily to the work of Cook in the Pacific Northwest the coasts are rendered with considerable accuracy. The interior of North America, particularly the American West, is still rather vague, though much of the cartography is clearly derived from Humboldt's explorations. Notes the apocryphal River Buenaventura as well as a conjectural placement of the western extreme of the Missouri River. The United States, still quite small, does not yet include Florida, Louisiana, California or Texas. Very good condition. Minor toning and verso repair on original centerfold. Blank on verso. Wheat, Carl Irving, Mapping the Transmississippi West, 1540-1861, v. 2, no. 310. Rumsey 0732.062. Phillips (Atlases) 724. National Maritime Museum, 409.